What is the scariest thing you can think of? Monsters? Vampires? The dead coming back to life? How about this one: you are lying on your bed one night when there is a knock at the door. You get up, open the door and standing before you, knocking at your door, is yourself. Eight friends: Em (Emily Baldoni), Kevin (Maury Sterling), Mike (Nicholas Brendon), Beth (Elizabeth Gracen), Amir (Alex Manugian), Laurie (Lauren Maher), Hugh (Hugo Armstrong) and Lee (Lorene Scafaria) have all gathered at Mike’s house for a very typical dinner party. The night of this dinner party carries cosmic significance as Miller’s Comet is passing by the Earth, and everyone has a superstitious take on what the comet will bring. Some of their superstitions are proven valid when their cellphones break and the power cuts out. They look outside and see that there is only one other house with the lights on, and Amir and Hugh volunteer to investigate. They return with some disturbing news, the house they went to, was Mike’s house and the people they saw, were these people. To make matters more complicated, the two that returned might not be the two that departed. Questions plague the group of eight: If I am here, how can I be there? Are they exactly like us? Are they the other side of us here? This idea troubles Mike the most because he is a recovering alcoholic. In this house, in this reality, he is in control of his addiction. Is that true over there? Is Other Mike a hopeless drunk? Or worse, is Other Mike a happy drunk? What is worse, knowing that there exists another version of you that continues to cause pain and destruction or that there is another version of you that is content? 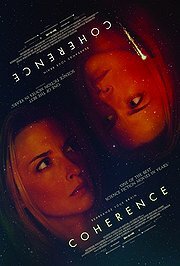 Coherence is the first feature film from James Ward Byrkit and it takes no-budget cinema to the next level. Working with eight actors and one location, Byrkit crafts an entire universe of permutations that gets more and more blurry as the story moves forward. With very little money at his disposal, Byrkit turns away from special effects and visual bravado and embraces relationship dynamics and philosophical conceits to give his movie a unique sense of self. Byrkit and editor Lance Pereira, punctuate the story with brief moments of black. At first, these quick moments of black seem completely unnecessary, a bit of style that gets in the way of the story to remind the viewer that they are in fact watching a movie. As the movie progresses, these moments of black punctuate action and ideas, much like a commercial break in a television show. However, this bit of style is revealed to be something much more as we realize that the story we are watching contains more than one universe. These bits of black take us from one house to the next, without any identification as to which one we are watching. The more we learn, the more we become confused. The concepts and execution of Coherence hinges on a popular thought experiment known as Schrödinger’s Cat. In a nutshell, Schrödinger’s Cat proposes a scenario where a cat is placed in a sealed box with either radioactive or explosive material. Since the box is sealed, we do not know if the cat has died from radioactive poising or from the explosion, and, scientifically speaking, the cat is and is not simultaneously. Only by opening the box, do we collapse the two possibilities into one reality and discover if the cat is alive or dead. This ties to the very act of watching a movie, as we—the viewer—collapse all possible scenarios into the one we are seeing. Every character in this movie, or any movie, has the possibility of existing and not existing until we see them (or don’t see them), thus collapsing all possibilities into one reality. In a perfect world, the reality we are seeing is the best of all possibilities. With Coherence, it is. This entry was posted in Reviews and tagged Alex Manugian, Coherence, Elizabeth Gracen, Emily Baldoni, Hugo Armstrong, James Ward Byrkit, Lauren Maher, Lene Bausager, Lorene Scafaria, Maury Sterling, Nicholas Brendon. Bookmark the permalink.